The hustle and bustle of a local fish market – usually seen in the pre-dawn dark, with bare-bulb lights illuminating what’s for sale and the shouts from sellers (usually in a language I don’t understand but with meaning clear enough to get out of the way of carts brimming with ice and fish) – is my favorite place to learn about small-scale fisheries. This is where it all comes together, with fishermen landing their catch, buyers (usually women) negotiating prices and customers buying products for that day’s meal or business. Here is where I am a learner and observer – hearing details about challenges these individuals face in maintaining their livelihoods, seeing the pride people have in their work and chatting about what we all can do to sustain the jobs, food, communities and ecosystems that are part of this system. Supporting small-scale fishing communities is the most rewarding part of my job. 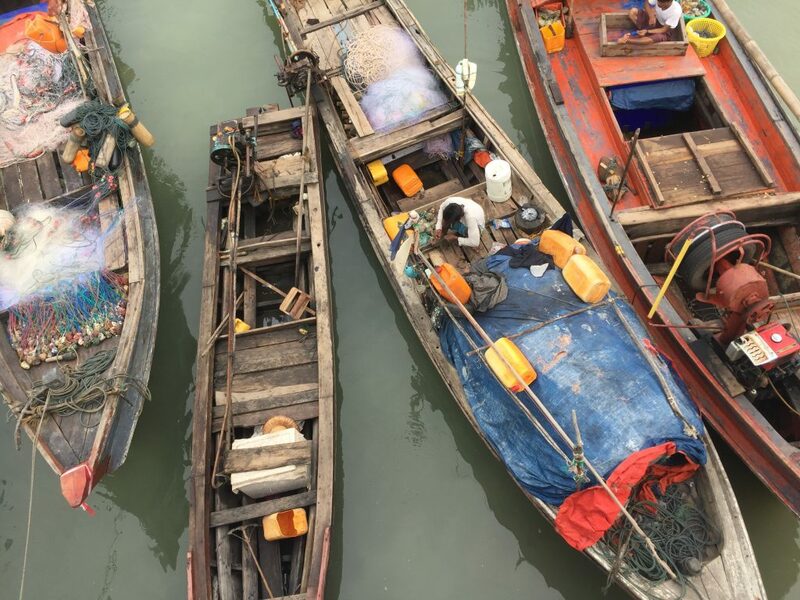 After all, three billion people depend on fishing for their livelihoods and rely on fish for protein and essential micronutrients—with over 90% of them operating in small-scale fisheries, many of whom live in developing countries. Including the voices of these fishermen, women and communities is instrumental to their efforts to build sustainable, science-based fishing approaches that protect their access to seafood and livelihoods. My colleagues and I are driven personally and professionally to help spur local action. We’ve found that the key to sustainable, lasting solutions is to deeply engage with the people who understand their fisheries best, empower them with tools to design local solutions and facilitate discussions and collaboration at scale, including throughout the supply chain, and thus elevate their collective voices. Over the past several years we have formed relationships with small-scale fishers around the globe—including in Belize, the Philippines, Myanmar, Mexico, Spain, Cuba, Portugal and Chile. That’s why I was thrilled to attend the World Small-Scale Fisheries Congress, convened by Too Big to Ignore in Thailand. This important event is a convening of fishers, fishers’ organizations, researchers, policymakers and environmental groups to share information about the global landscape of, and challenges facing, small-scale fisheries. The Congress emphasized the Voluntary Guidelines for Securing Small-Scale Fisheries (SSF Guidelines) and the role of small-scale fisheries in meeting UN Sustainable Development Goals. The SSF Guidelines are the first international instrument to recognize the importance of small-scale fisheries and lay out principles to address poverty, eradicate hunger and promote sustainable development in small-scale fishing communities. Action Oriented: This year’s theme – “Transdisciplinarity and Transformation for the Future of Small-Scale Fisheries”—focused on convening people to take action. Small-scale fishing groups and organizations are working closely with the FAO to develop strategic global platforms for SSF Guideline implementation. They have formed advisory groups and bodies, and advocate for knowledge sharing platforms and capacity building which will support local governments and ensure implementation. Local engagement: Understanding what successful community-level implementation looks like was a core theme addressed by participants. Fishing communities are the closest to changes on the water and know their needs intimately. It’s clear that in order for the SSF Guidelines to become a reality, fishers and local communities have a core role to play in helping their governments implement them. The Congress had representation from fishers from around the world and a strong emphasis on cultivating fisher to fisher conversations. Role of women: The role of women in global fisheries, often unseen in work like processing harvest for market and prepping or repairing gear, is dramatically underestimated. Women play a crucial role throughout fishery supply chains—not only as direct harvesters, processors, buyers or supporters—but also as leaders in the community. The SSF Guidelines recognize these varied and important roles and the need for their voices and interests to be represented in management decisions. Many Congress participants shared research on women’s roles, bringing needed perspectives to the table. NGO collaboration: Many NGOs at the Congress shared information on how they support small-scale fisheries, with a noticeable move towards working together to support local governments and communities. This is encouraging because together our efforts can be more impactful for fishing communities. Collaboration across NGOs increases our ability to provide comprehensive and user-friendly tools and resources. It can also raise the profile of disparate efforts into a global movement by sharing experiences from small-scale fishing communities from all corners of the world. Climate impacts: A number of participants discussed climate change and how its impacts are already being felt by fishing communities. This focus on climate was accentuated by the recent IPCC report confirming that governments will need to curb emissions dramatically to hold warming to 1.5 degrees Celsius. Ensuring that fishing communities have adaptive strategies in place, are empowered to work together to plan for managing shifting stocks and have the resources to carry them out is crucial to their success. Since the last convening, clear progress has been made in advancing sustainable small-scale fisheries around the globe, even if many challenges remain. At EDF, we’re seeing our active work to advance SDG 14 (Life Under Water) targets pay off around the world as communities make progress to improve access of small-scale fishers to marine resources, manage and protect ecosystems and design and implement science-based management plans. Attending this convening dedicated to finding collaborative solutions was empowering and encouraging. Small-scale fishing communities are already taking hold of their own futures, and it’s clear that a wide community of stakeholders is committed to paving the way for their continued success. Managing Spain’s small-scale fisheries with limited data? ¡Sí se puede! 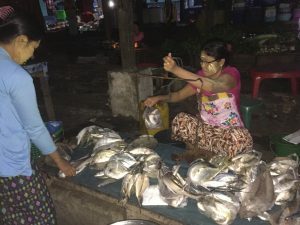 This entry was posted in Global Fisheries, International and tagged climate, small scale fisheries, small-scale fisheries, women in fishing, World Small-Scale Fisheries Congress. Bookmark the permalink. Both comments and trackbacks are currently closed. EDFish is the voice of oceans experts at EDF working around the world to create thriving oceans that provide more fish in the water, more food on the plate and thriving fishing communities.